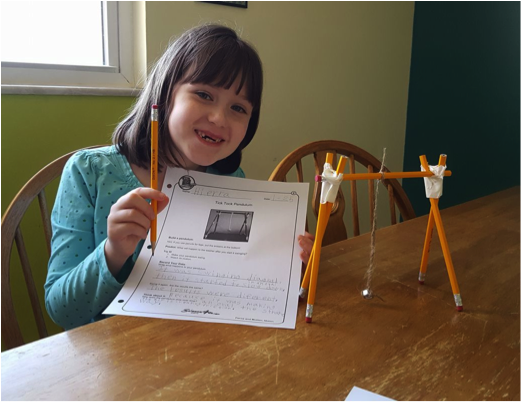 Science4Us (S4U) is a curriculum designed to address the long-standing and deepening deficit in science skills and interests created by the generally weak and often non-existent science education provided in early elementary schools across the country. Science4Us is an interactive technology-based curriculum for K-2nd grade students designed to deliver an exemplary science education within the realities of the American education system over the next decade Science4Us is based on the 5E Instructional model in which for each of the 28 modules, students will engage, explore, explain, elaborate or evaluate with the materials. Science4Us focuses equal attention on delivering a student experience and on providing a teacher support, training, and information system. The online curriculum components were produced with television-quality audio visual production values. The materials include interactive exercises, often scaffolded so that the students can progressively explore and master key concepts. The curriculum is composed of animated stories, interactive lessons, videos, animated simulations, videos of real world experiments and phenomenon, casual games, stories, music, and points to discuss or ponder. Since the target audience is primarily pre- or emergent readers, S4U is developed with systematic voice overs and repeat buttons throughout for those moments when students lose concentration and missed a question or instruction. The curriculum supports multiple usage models for whole class instruction, small groups, or individual one-to-one independent work. Science4Us is available both through the web or as an app. While the curriculum is entirely technology delivered, there are <how many> digital activities and <how many> hands-on activities. 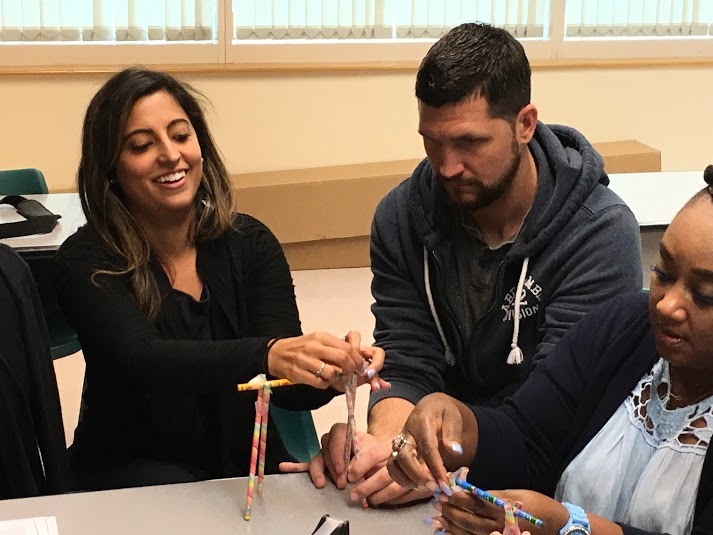 This allows teachers to provide real world hands-on activities to ensure a strong connection between the conceptual and real world. Each student’s progress and records are systematically recorded and provided to the teacher including a digital notebook which includes the student’s notes, predictions, observations, and results. Science4Us was developed using modern best practices including a focus on big cross cutting concepts and sophisticated reasoning to build depths of knowledge. Because cross curricular study is a best practice, the curriculum is infused with literacy and math skill building exercises. At times in the early grades, the math and science standards heavily overlap such as in measurement, data analysis, and data portrayal. In these cases, Science4Us provides not just practice but instruction that directly maps to key CCSS objectives. Of the over 350 online exercises, about thirty percent directly relate to practicing key literacy and math skills. Science4Us Version1.0 was developed from 2010 through 2013 with a team of over a dozen full time educators and developers. Science4Us is built around science standards and has been vetted by a McREL efficacy study. The educational model was studied and iteratively refined by a Dept of Education IES SBIR Phase 1 research study. Both of these studies, the first year of experience in the market place, and a literature review all reveal one overarching challenge for Science4Us or for any science curriculum targeted at early elementary school. The problem is that most schools and teachers are under extreme pressure for short term measurable progress and success on literacy and math. Thus the teaching of science is considered a luxury that they cannot afford. More specifically, at the operational level in schools, science is considered a distraction from the mission-critical need to improve core literacy and math skills. While Science4Us builds these skills through practice, this cross curricular link has been repeatedly discussed by Science4Us users and potential users and the route to Science4Us having a much larger impact. The goal of the Science4Us SBIR project will be to develop, assess, and refine a model for S4U Version 2 in which CCSS literacy objectives are explicitly reinforced and assessed. Evaluations will track student progress in both science and literacy, providing important data that will to inform subsequent instruction. The desired outcome of the SBIR is a curriculum which schools can justify using as a time-effective supplementary product to build CCSS literacy skills. It will explicitly build (but not introduce) and evaluate key CCSS literacy skills. S4U Version 1 was built on a cross curricular approach and an ambitious model of building higher order thinking skills so this shift to a focus on CCSS extends inherent elements of the S4U curriculum. It is not a superficial renaming or correlation. The effectiveness of S4U as a science curriculum following a 5E Instructional Model will be maintained: the major change in the curriculum is to extend the cross curricular practice from the fourth E across the other four “Es” through-out the curriculum. I just read a fantastic article about building human capital for better teaching of science in the early elementary grades around the US. It was such a good article that with their permission (actually without but I’m providing really good citations back to them). Here’s the gist of a great article on how to actually address the weakness in US science education which is not just a dirth of teachers and coolness in middle school through high school but really starts with systematic problems in the youngest grades for teaching and enlisting students in science. Our teachers need a lot of help to teach science and science inquiry, especially at the younger grades. At our higher grades, we have dedicated science teachers but in kindergarten through second grade, we have the whole class teachers and they just aren’t that comfortable with teaching science. In the Explore, the students formulate ideas or hypothesis about the content area and then seek to explore these ideas. In the Explain, the students seek to articulate what they learned in the Explore process. The Elaborate does a number of things but in its purest form, the elaborate should be a refinement of the original exploratory question or an application of that hypothesis in a more far-reaching way. The elaborates not only refine the inquiry or seek to apply it in a more sophisticated manner, it also builds language arts and math skills by providing instruction and practice. The Science4Us implementation of the complete 5E instructional model starts with an in-depth Engage section so that the prior knowledge of the students is evoked. Prior hypothesis and common understandings and misunderstanding are surfaced through a number of techniques. The 5th E, Evaluate, is a show-what-you;’ve-learned exercise in which knowledge and skills acquired are demonstrated even if the students are preliterate. This 5E Inquiry Model is followed by each of the 28 modules covered in Science4Us. A usage pattern of 8 sessions for each module which can be covered in two weeks, four days a week. Around 350 interactive exercises that can be delivered as whole class discussions, in small groups, or one on one with a computing device (tablet, Chromebook, computer). Most classes blend these different delivery model with the Engage and Explore being the ones most likely to be done as whole class instructions. Part of this is teachers really like leading Science4Us-based lessons. Over a thousand printable activities covering worksheet versions of most of the interactives (especially the evaluates) and also, large numbers of hands-on inquiry-based activities as wells as STEM or STEAM extensions. 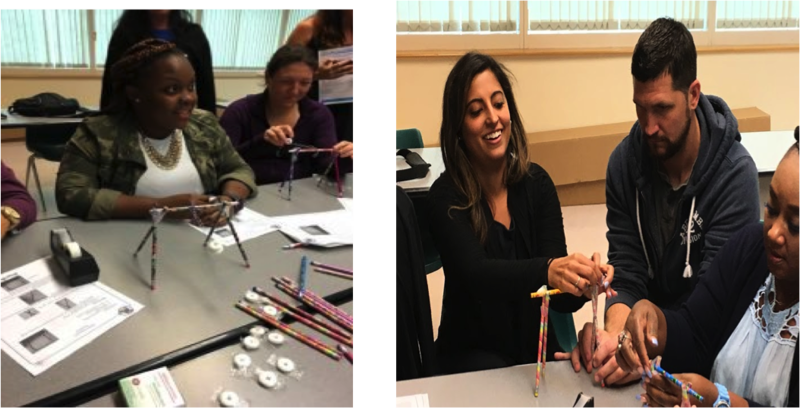 For instance, the pictures above are taken from a teacher training in which the teachers are asked to the hands-on activities to explore how a swing works in the motion module of physical science. Materials just for teachers include lesson plans, teaching tips, and common misconceptions. These materials are typically one to two pages long and in following a strict format, teachers quickly get comfortable delivering Science4Us lessons to their students with minimal preparation. The PD model of Science4Us is flexible. Generally, the online videos and tips make accessing the materials, software, and lessons easy so they require minimal training time. The PD time is best used taking the teachers through a module as if they were students so they receive the materials and see how the 5E Instructional Model really does render intimidating concepts into simple steps. Most importantly, it illustrates who a proper structure to 5E-based instruction has the students doing science inquiry as a routine part of the process. In many schools, the PD has several steps of implementation, including having Science4Us staff model lessons to the students. Here is more information on how LearningCity provides help with teacher training for Science4Us, VocabularySpellingCity, and WritingCity. All states are required to include a science assessment in each of the three-year elementary grade bands (NCLB, 2001). Current amendments to the ESEA heighten the demand for increasing science achievement and preparedness by focusing attention on Science, Technology, Engineering, and Math (STEM) Education. The focus on science is further reinforced by allowing states to include science achievement as part of their accountability systems and proposing modifications to state assessments to “measure students’ complex problem-solving and analytical skills” (PCAST, 2010). Within this framework of heightened focus on science education, S4U provides not only a standards-based curriculum and research-based best-practices model, but also embedded online teacher science content and instructional model (5E) training and offline teacher/parent support. By catering to STEM objectives and 21st century learners’ needs, S4U enables both teachers and students to reach the goals set forth by these federally mandated initiatives. 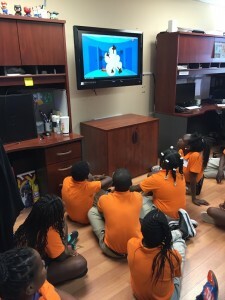 S4U specifically addresses the need for an innovative, flexible, and cost-effective science curriculum driven by both the inclusion of science on high stakes assessments and the movement toward computer-based testing. Many online, virtual models are used across the nation, with assessments embedded in online curricula. Nationally, more than half of the U.S. (27 states) have piloted online tests for statewide or end-of-course exams (Quellmalz & Pellegrino, 2009). Similarly, portions of the NAEP assessment are computer-based (Sandene et at., 2005). The movement to computer-based assessments in K-12 education is here and early exposure to online evaluations as casual, non threatening interactions seems essential. The digital curriculum and assessment models offer another discrete advantage to educators. As standards change, online models, such as S4U are able to evolve and adapt in real-time, incorporating new standards much more quickly than traditional text approaches. In the near future, science classrooms may be held accountable for the Next Generation National Science Standards based on the NRC Conceptual Framework for the New Science Education Standards (2011). New print texts designed to align with fluctuating state and national standards will have more trouble keeping pace with the need for current curricula. Electronically deliverable student content and professional development components offer a solution to the problem of providing an efficient, cost-effective implementation of new standards, within a real-time transition. Science4Us is poised to offer these solutions to schools. 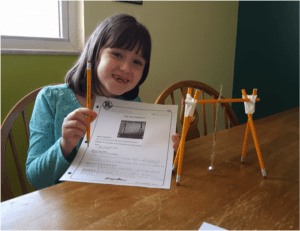 Elementary students are currently not prepared to handle complex science concepts. The 2009 results of the National Assessment of Educational Progress (NAEP) indicate that more than half (66%) of fourth grade students perform below proficient level on the science assessment (National Center for Education Statistics, 2011). Duschl et al. (2007) state that too little commitment to or enthusiasm for science exists and that students are exposed to too many facts and not enough experiences to help them understand processes and big ideas. Although studies have shown that not only are young children able to perform abstract reasoning (Warren, 2005), but that they are developmentally ready for the complex ideas and relationships that make up scientific inquiry and the nature of science (Akerson & Donnelly, 2010). The S4U curriculum addresses the issues presented by Duschel et al. (2007) by providing an inquiry-based online adaptation of the 5E Instructional Model. The S4U modules include interactive serious games for engagement, simulations to promote critical higher order thinking skills, teacher and parent curriculum support materials, embedded professional development, an effective scope and sequence, and a student portfolio/learning management system. S4U’s design is guided by two overarching principles: one is educational effectiveness for both students and teachers, the second is commercial success. 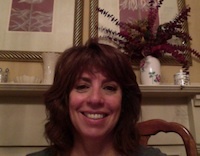 a blog called the Digital Toolbox: Valerie Harlow Shinas, Leah Van Vaerenewyck, and Barbara Steckel. U blog post about VocabularySpellingCity which was developed by the same team that developed Science4Us. In fact, VocabularySpellingCity didn’t get as much attention as it deserved in 2012-13 since the team was focused on Science4Us. However, they are now moving back and users can expect more significant functionality and aesthetic updates in the year ahead on the VocabularyCity site. Their blog post reviews the basic functionality and cites many of the correlations. The BSCS 5E Instructional Model is grounded in sound educational theory, has a growing base of research to support its effectiveness, and has had a significant impact on science education. The most noticeable void in the literature is research exploring how the 5E approach helps students develop an understanding of the nature of science, and practical and teamwork skills. These conclusions indicate the need to conduct further research comparing the effect of the 5E Instructional Model on mastery of subject matter, scientific reasoning, and interest and attitudes with other modes of instruction. Continued work is expected to lead to refinement of the model based on research on learning. The five phases of the BSCS 5E Instructional Model are designed to facilitate the process of conceptual change. The use of this model brings coherence to different teaching strategies, provides connections among educational activities, and helps science teachers make decisions about interactions with students.